Tuesday July 4th 1899 It rained so we did not get out of the house till two oclock in the afternoon to ride around the town before I started home at six oclock. I have had a very pleasant visit. I went back to the Harris house and we watched the fire works from the front porch. They have had a big day. Weather very warm. Wednesday July 5th 1899 John took me to the depot. I got to Hill Siding by 11.30 and Will met me. The boys had been doing their own work for two days. Emma's Mother is sick I was busy all afternoon about the place. 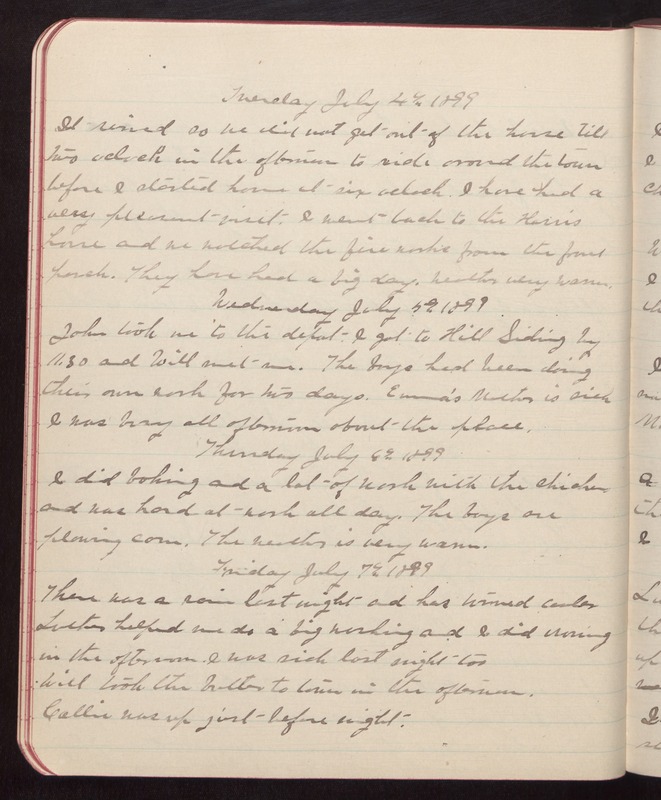 Thursday July 6th 1899 I did baking and a lot of work with the chickens and was hard at work all day. The boys are plowing corn. The weather is very warm. Friday July 7th 1899 There was a rain last night and has turned cooler Luther helped me do a big washing and I did ironing in the afternoon. I was sick last night too Will took the butter to town in the afternoon. Callie was up just before night.